Spencer Lewis Marketing Group has won multiple awards for Annual Report designs over the last 7 years and was recently awarded 2 more additional awards at the Annual American Advertising Awards event this year in Riverside, Ca. The agency has won multiple awards for Annual Report designs over the last 7 years and was recently awarded 2 more additional awards at the Annual American Advertising Awards event this year in Riverside, Ca. 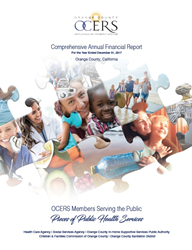 The two awards this year were for the Annual Report for the San Bernardino County Employees’ Retirement Association (SBCERA) and the Orange County Employees Retirement System (OCERS). The Annual Report for SBCERA featured over 160 pages of information, coupled with high end photography and custom graphics, to communicate the many visual wonders of San Bernardino County theme along with the organization’s financials. “Annual Report design and production is crucial in communicating financial information to all stakeholders as it must communicate competence, stability and accuracy…all in an easy to read, friendly way,” Glaspell says.